My baking days are usually on the weekends because I have class Monday through Wednesday. I get kind of antsy on Wednesdays because I haven’t baked in a while and sometimes I catch myself daydreaming about kneading bread or thinking about what bread I will be making the next day. So last night when I was cleaning the kitchen I realized there was a bottle of Budweiser that we hadn’t touched in over a year, just taking up space. I had been organizing my recipes and found Slow Learner’s beer bread recipe, so I decided to try it. 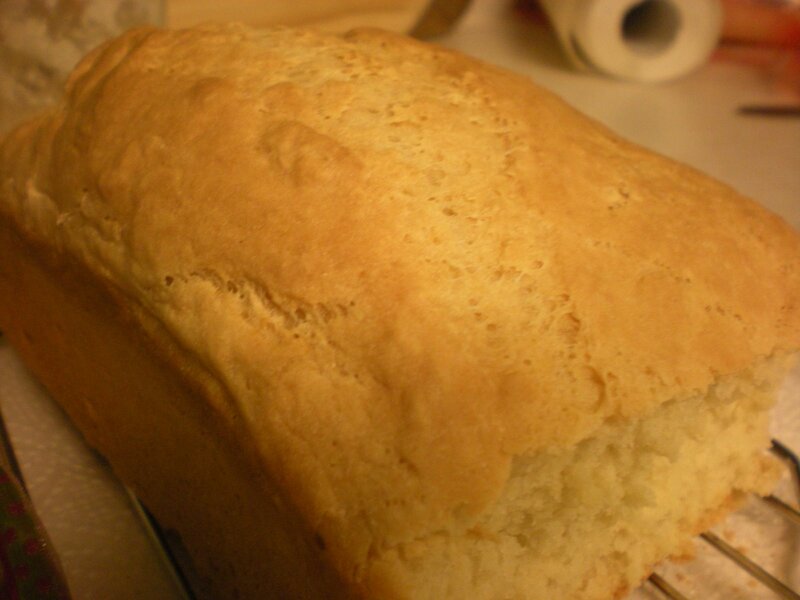 The beer bread relies on baking powder to cause it to spring up in the oven. 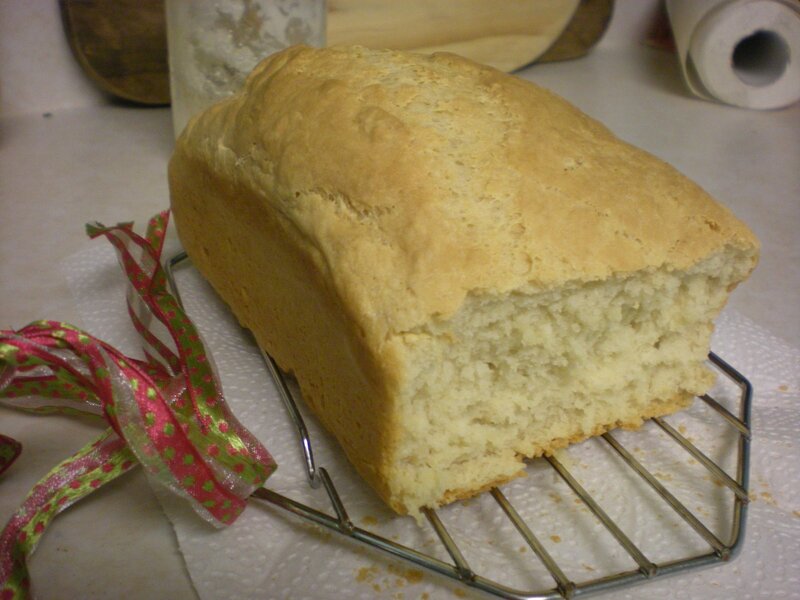 I’ve made soda breads before, and it’s the same concept with the baking powder in this recipe. So I threw the flour, salt, baking powder, and beer together in a bowl and mixed it together, then put it in a bread pan to go in the oven. What came out was not what I had expected! 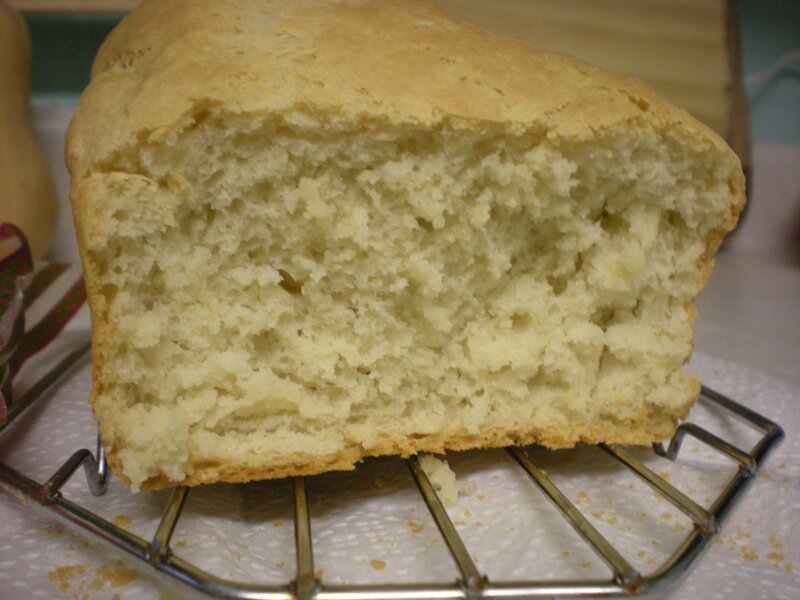 The loaf was super-soft and flaky, like cornbread. The flavor initially was nothing like beer, but had a very creamy taste. Today I had another piece and you could taste a VERY subtle beer taste. If you didn’t know it had beer in it, I’m not sure you would guess it was in there. After other mishaps trying to use beer and beermaking byproducts in bread, I was expecting something much stronger. So that was fun. I do like how quick and versatile soda breads are. While I don’t think there should be a difference between cooking wine and drinking wine, maybe there can be a distinction with beer? Will have to think some more on that. Bake in greased bread pan at 375 for one hour. It’s a great recipe to throw together because it’s mostly staples. You don’t even need yeast! Go try it! Now! I had COMPLETELY FORGOTTEN about that recipe! Thanks for bringing it to mind. That’s definitely a good one, and I’m glad you found it and enjoyed it!I’ve been on the look-out for multiple flours with which to experiment. I have bread, cake, whole wheat and AP flour, so I’m on the look-out for something a little more adventurous. And I LOVE your seed bread! Since Fast Learner is coming to town Wednesday night, perhaps she can offer some guidance on some options, too.I also finally got myself a halfway decent food scale. Now I just need to convert from imperial to metric.At some point would you elaborate on your starter, and how to start a starter? Is that the flour, salt, yeast, beer, water, vinegar combo that is encouraged to develop over the longer term? How often do you feed it, and how much? Thanks in advance!